Good Article: What Does a ScrumMaster Do? Many people in my CSM classes start by thinking that the ScrumMaster job is easy and can be part time. Here’s a good article that summarizes why this is not the case, and provides even more useful references. New to Agile? What Does the ScrumMaster Do Anyway? Berteig Consulting is a silver sponsor for the 2009 Toronto leg of the Agile Tour conference. The date for Toronto is October 20th. You can find more information at the Toronto Agile Community web site – http://www.torontoagilecommunity.org/. Agile methods are now popular enough that the Project Management Institute has officially recognized them in a number of ways including setting up an agile project management community for PMI members. This is a good sign, and I re-joined the PMI as a result. However, there is still a big gap between an Agile adoption and an Agile transformation. Between doing agile methods for project management and transforming your organization to become agile in all aspects of its work. Most people are “doing” and “adopting” agile, not doing the deep transformation. For some years now, the premise I have been working on is that agile methods are actually all about learning. They aren’t about product delivery. Rather, product (or service) delivery is the context for learning. What does this matter? Let’s imagine two similar organizations, Abacus and Brightstart. Both organizations want to improve the way they are working. In fact, they both see many similar opportunities in terms of efficiency gains, productivity gains, and improvements in customer satisfaction and employee morale. Abacus is headed up by Alex who is a visionary leader whereas Brightstart is headed up by Brit who is a hard-nosed bottom-line kinda person. Now just to make this interesting, let’s pretend that Alex doesn’t understand Agile and just wants to use an agile method as a way to improve the delivery of projects at Abacus. Brit, on the other hand, has some trusted advisors who have insisted that agile be treated as a fundamental transformation in the way Brightstart does business. What happens? Alex gets a staff member to attend some Scrum training and launch an agile pilot project. Stakeholder satisfaction improves because of the frequent feedback. Some agile best practices such as timeboxing and prioritized user stories are easily adopted but others are harder. In particular, some of the obstacles uncovered by the team are related to the corporate culture of consensus-building which Alex considers to be a non-negotiable part of the organization. Abacus is infused with the values and personality that Alex has brought to the organization as its founder. So when the team had trouble getting clarification on its work because the consensus-building process was taking too long, Alex simply told them to move on to less important work and come back to the other stuff when it was “ready”. Over time, there are modest improvements in productivity and customer satisfaction at Abacus, and most of the project work is done with an agile approach using several agile “best practices”. But any time a team encounters an obstacle related to the culture of the organization, the team loses. Gradually, agile is treated as just another method, just another tool that may or may not be applicable to the work being done. Brit researches Agile methods deeply and comes to understand that there is a process component, but also a meta-process component. Brit decides that the potential benefit is huge: multiplying productivity, increasing morale enormously, and becoming a leader in the marketplace… but that the level of effort to get there is also large. Agile is not a “silver bullet“. Truly doing agile requires a deep cultural change in an organization. Brit is fully aware that changing cultures is enormously difficult. 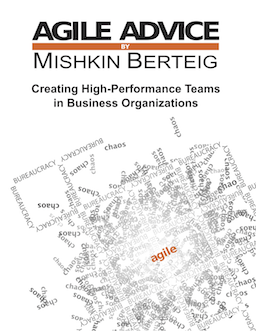 Brit decides that all work throughout the whole organization must take on an agile culture. This is a culture that allows for experimentation and regular reflection and learning. As well, Brit knows that like an athlete training for a major sporting event who gets a top-notch coach, Brightstar will also need a coach. Internally driven culture change is even more difficult and since Brightstar isn’t in deep crisis, there isn’t as much motivation for staff to fundamentally change the way they work. A coach will help to keep the motivation, vision, and encouragement flowing so that the corporate change will be sustainable. Finally, Brit announces to the organization that no opportunity for learning and improvement will be denied. Over the course of several months, this is demonstrated by several interesting incidents where staff suggestions for obstacles to be removed are acted upon quickly and decisively. Not every suggestion results in real improvement, but all the employees quickly get the message that the environment of learning is real, and the pace of suggestions increases as does the level of individuals taking initiative to make changes directly. Within a year, productivity at Brightstar has soared. There is an initial bump in staff turnover as some people who were there with an “it’s just a job” attitude moved on. After the first year, employee staff turnover rates have decreased substantially, and can mostly be attributed to changes in personal circumstances such as marriages and deaths. Brit gets it, and is willing to be hard-nosed about learning. Learning about product, process and people. The leader of the organization decides that agile is more than just another method of project management or product development, and that the vision of an agile organization is worth the effort to make a deep transformation throughout the entire organization. The coaches and the Agile Transformation Team work with employees to develop a sufficient number of people who are capable agile facilitators. They learn about agile methods more deeply: practices, principles, variations, techniques, and tools. They learn to be effective facilitators who have the trust of their co-workers. These facilitators then become responsible for ensuring that everyone else is using the agile meta-process for effective learning and simultaneously applying appropriate agile practices. Finally, the coaches work with the Agile Transformation Team to help a relatively small number of employees to become internal coach/trainers. These are the people who will take over from the external coaches. As an ongoing assistance, the coaches should be working in a consultative capacity as the organization struggles with obstacles, restructuring, and the deeper culture changes. Like any change effort, there are five critical components: sponsorship, communication, training, support and strategy. The coaches should be advising the Agile Transformation Team and management on how these five components can best be handled for the agile transformation. Imagine you are doing surgery – a routine tonsillectomy on a father of two young girls. His name is Dan. Something goes wrong with the anesthesia and his heart goes nuts. The defibrillator is brought out, the paddles applied to Dan’s chest and you yell “CLEAR!”. You trigger the defibrillator, but nothing happens, just a small clicking noise. The technician quickly checks the machine, and everything looks okay. You try again. “CLEAR!” There’s a small buzzing noise and your patient’s body trembles slightly. You put the paddles down, and, getting frantic, yell at the nurses to “go find another defib machine, NOW!!!”. Thirty agonizing seconds pass. Dan’s vital signs are deteriorating. One of the nurses rushes into O.R. with a cart with another defibrillator machine on it. Everyone works like a well-oiled machine to set it up. Another fifteen seconds pass. It charges up and you apply it again to the chest of this young father. “CLEAR!” There’s a huge electrical discharge and Dan is killed instantly. It takes a few more minutes for him to be officially pronounced dead. If this had been a description of a real event, you would be furious and bewildered. You would sue the hospital for buying shoddy defibrillators. You would sue the company that made them. You would demand that the defibrillators work better – one hundred percent of the time would be about right! Let’s stop running projects this way. Traditional project management practices are like unreliable defibrillators. They work about 30% of the time. Agile is the only known reliable defibrillator for your organization’s heart. Like a defibrillator, knowing how and when to use agile properly is still hard. That’s where we come in. We’re experts in using agile methods to fix the heart of your organization. Contact us before your organization flatlines.